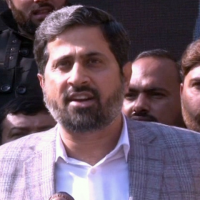 Punjab Information and Culture Minister Fayyazul Hassan Chohan on Tuesday lashed out at journalists for asking a question regarding his stance on comments made by Jamaat-i-Islami (JI) chief Sirajul Haq, who had questioned the Pakistan Tehreek-i-Insaf (PTI) government’s efforts to turn Pakistan into an Islamic welfare state. While talking to reporters after attending an event arranged to honour the late JI leader Qazi Hussain Ahmed in Lahore, Chohan was asked about Haq’s claim that the ruling party had not taken any “step towards building a Madina-like Islamic state”. The question angered the provincial minister, who criticised the media for being “inconsiderate” for asking him about Haq’s comments at an event arranged in memory of Hussain, the late JI Emir. “You should not ask such a question which can create a contradiction, out of respect,” Chohan told media representatives. The minister also declared that the media “should not be out of bounds”. His statements prompted a protest from journalists, who said that the media has the right to ask questions and the minister could choose not to answer. They demanded that Chohan retract his statement and surrounded him when he started to leave. The journalists pointed out that Chohan had made political statements himself when he alluded to “looters” and “thieves” in his media talk. The provincial minister left without any further statement. This is not the first time a minister from the ruling PTI has acted brashly with journalists. Last week, Federal Minister for Water Resources Faisal Vawda lost his cool when Dawn’s senior journalist Khaleeq Kiani asked him about the government’s decision to award the Rs300 billion Mohmand Dam project on a “single” financial bid of a consortium that includes Descon, a company owned by the Prime Minister’s Adviser on Commerce. “Your party had strongly criticised the LNG deal because it was done on a single-bid basis, and now your government has awarded the contract of Mohmand dam on a single-bid basis. How can you say it is legitimate?” Kiani had questioned. At this, the reporters at the press conference objected to his choice of words and started walking out in solidarity with Kiani. Vawda then attempted to placate the media personnel but his efforts were in vain as reporters and cameramen staged a walkout.